Does Tesla Deserve Your Investment Dollars? How Tesla stands up to a tested strategy of investment analysis. Electric-auto maker Tesla Motors (NASDAQ:TSLA) is attracting a lot of attention. On Jan. 14, Tesla reported expected 4Q revenues to "exceed prior guidance by approximately 20%." Since then, Tesla shares have enjoyed a significant rise in price, passing previous records from September 2013. Telsa announced its fourth quarter figures on Wednesday, and it did not disappoint investors who have been picking up its shares at increasing prices. Tesal beat expected earnings by well over 20%, with $0.33 per share compared to the expected $0.23-$0.26 per share. 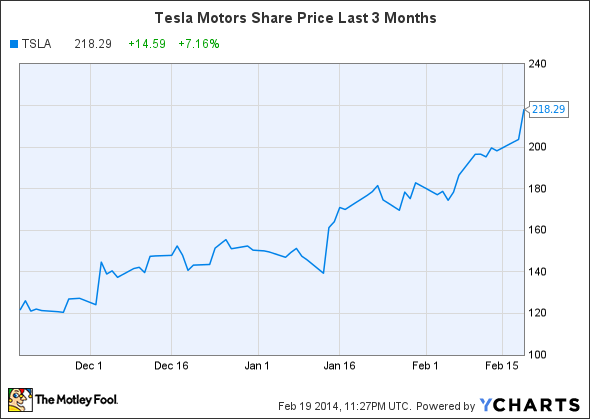 Unsurprisingly, Tesla shares are again on the rise. These short-term developments are impressive sounding and certainly fun to follow, but they don't give us enough information to invest on. Is Tesla a good company? Can we dig into it and, after we're through, decide confidently that the stock deserves our investment dollars? Let's see how Tesla stands up to some common investment criteria in a comparison to a few competitors. First, we like to see a company have consistent earnings growth. This is a common criterion because companies that have a track record of profitability and resilience tend to make investors a lot of money. In this first measure, Tesla is at a significant disadvantage. Telsa is a young company, and not only has it yet to have a year of positive net income, but its net losses have increased each year. Tesla is spending top dollar to "attract, retain and incentivize talented, deeply qualified, and committed executive officers," and maintain significant research and development programs, and these expenditures quickly wipe out revenue from its low (but growing) sales. In contrast, Ford (NYSE:F) has enjoyed high earnings over the past four years. While earnings have grown inconsistently, it is clear that Ford is a proven company of profitability and resilience. Ford's annual net income has ranged from $2.7 billion-$20.2 billion since 2009. General Motors (NYSE:GM) has had similar earnings success over the same period, with income ranging from $6.1 billion to $9.2 billion. These consistently high earnings make Ford and GM attractive investments; Tesla's position is less clear from this measure alone. Second, we look at a firm's return-on-equity, or ROE, an important metric that tells us how much the company can earn with limited investment. Again this puts Telsa at a disadvantage. Without positive earnings, ROE is negative. While Telsa's ROE is at -55%, Ford's and GM's are at 38% and 13%, respectively. If an established company had ROE of -55%, we would immediately eliminate it from consideration. But just as we don't condemn the young Tesla for its negative earnings, we take its negative ROE with a grain of salt. Tesla's sales are low but growing; it's ROE will improve. In general, I like to hold companies with low debt, and this is especially true for young, high-growth firms like Tesla. Yes, there are certain benefits that a company can take advantage of by holding ceratin kinds of corporate debt. But I like the financial flexibility of low levels of debt, allowing a company to invest and expand as it determines is necessary in order to succeed in the long run. A great metric to use to look at the different debt levels of different companies is the interest coverage ratio. It tells us how many years of interest payments a company can cover with its current amount of earnings. Ford's earnings (measured by EBIT) are over 11 times its interest expense. GM's interest coverage is over 23. Compare that to a common rule of thumb that interest coverage ratios below two should be flagged for avoidance by most investors. Clearly, both Ford and GM are not significantly restricted by their levels of debt. Tesla's interest coverage ratio can be a little misleading. Because of its negative EBIT last year, the interest coverage ratio is -1558. And the numbers get a little less appealing when you look at more recent quarterly figures. Don't be alarmed by this bizarre number -- while negative earnings will pose serious problems if they persist, Tesla's annual level of debt is small and unburdensome. Fourth, we compare management teams at each company. Ford boasts one of the greatest CEOs in recent history, and GM's newly minted leader has not yet had the chance to showcase her ability to lead the company to consistent success. Tesla's CEO, Elon Musk, is perhaps one of the most energizing and driven leaders of our time. Co-founder of both PayPal and SpaceX, he has proven his ambition and capabilities, and he is a major reason why the three-year-old, unprofitable company is valued at around $25 billion. Tesla has the ideal leader to bring it into high profitability over the long run. Lastly, we consider Tesla's business model. Ford and GM provide the safer option, as they are already profitable and have an established customer base. They have distribution channels and supportive infrastructure in place. Elon Musk and Telsa give confidence to investors that sales will increase, charging station expansions will be effectively completed, and profitability will soon come to the company and its investors. But an investment in Tesla is not just a bet on a good leader and strong sales growth within the established auto industry. Tesla cars are not perfect substitutes to Ford's and GM's. An investment in Tesla is a bet on alternative energy and environmental sustainability. We can already see the major automakers valuing the fruits of Tesla's significant and ground-breaking R&D work. In fact, Daimler (maker of Mercedes-Benz) has been commissioning Tesla to develop new batteries for them for years -- just one example of Tesla's impact as a revolutionizing company, and not just a new competitor. Why discuss Telsa in the context of this five-point analysis? Why not focus on trends in its stock price, or look more closely at sales growth? Using this particular framework allows us to clearly and objectively interpret the situation. Telsa doesn't have good earnings or ROE numbers, its competitors do, and its debt situation is so-so. Tesla's CEO and business model are very promising, and an investment in Tesla (as opposed to Ford or GM, for example) is a bet on a significant change in the way we build and operate machines. This five-point framework is not my own; it comes from Warren Buffet's 2007 Berkshire Hathaway annual report. It is also used throughout The Motley Fool's "Million Dollar Portfolio" -- one of my favorite investment books of all time. These are tested methods of analysis, and investors are wise to use them to inspect potential investments. I encourage you to think about what Tesla is (and isn't), and what you think it will become. If investors are optimistic about the future of electric vehicles and Elon Musk, then I highly recommend taking a look at Tesla for a long-term addition to a diversified portfolio. Do your own research to identify features of the company that are important to you as an investor, and make your decision for the long term.